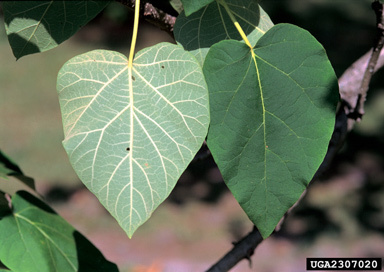 Deciduous tree to 60 feet (18 m) in height and 2 feet (60 cm) in diameter with large heart-shaped leaves, fuzzy hairy on both sides, showy pale-violet flowers in early spring before leaves, and persistent pecan-shaped capsules in terminal clusters in summer to winter. Abundant flower buds present on erect stalks over winter. Ecological Threat: Princess tree is an aggressive ornamental tree that grows rapidly in disturbed natural areas, including forests, streambanks, and steep rocky slopes. Biology & Spread: Princess tree can reproduce from seed or from root sprouts; the latter can grow more than 15 feet in a single season. The root branches are shallow and horizontal without a strong taproot. Seed-forming pollen is fully developed before the onset of winter and the insect-pollinated flowers open in spring. A single tree is capable of producing an estimated twenty million seeds that are easily transported long distances by wind and water and may germinate shortly after reaching suitable soil. Seedlings grow quickly and flower in 8-10 years. Mature trees are often structurally unsound and rarely live more than 70 years. History: Imported to Europe by the Dutch East India Company in the 1830s and brought to North America soon after. Historical records describe its medicinal, ornamental and timber uses as early as the 3rd century B.C. Its ability to sprout prolifically from adventitious buds on stems and roots allows it to survive fire, cutting and even bulldozing in construction areas. It is prized for carving. U.S. Habitat: Common around old homes, on roadsides, riparian areas, and forest margins in infested areas. Infrequently planted in plantations. Spreads by wind- and water- dispersed seeds. Invades after fire, harvesting, and other disturbances. Forms colonies from root sprouts. Distribution: Princess tree is found in 25 states in the eastern U.S., from Maine to Texas. Many native shrubs and trees make excellent alternatives to Princess tree. Examples include serviceberry (Amelanchier canadensis and A. arborea), redbud (Cercis canadensis), flowering dogwood (Cornus florida), American holly (Ilex opaca), red mulberry (Morus rubra), spicebush (Lindera benzoin), and sassafras (Sassafras albidum). Contact the native plant society in your state for additional recommendations and for information on local sources of native plants. Princess tree can be controlled using a variety of mechanical and chemical controls. Hand pulling may be effective for young seedlings. Plants should be pulled as soon as they are large enough to grasp. Seedlings are best pulled after a rain when the soil is loose. The entire root must be removed since broken fragments may resprout. Trees can be cut at ground level with power or manual saws. Cutting is most effective when trees have begun to flower to prevent seed production. Because Princess tree spreads by suckering, resprouts are common after cutting. Cutting should be considered an initial control measure that will require either repeated cutting of resprouts or an herbicidal treatment. Cunningham, T.R., S.B. Carpenter. 1980. The effect of diammonium phosphate fertilizer on the germination of Paulownia tomentosa seeds. Tree Planter's Notes 31:6-8. Hu, Shiu-Ying. 1959. A monograph of the genus Paulownia. Quarterly Journal of the Taiwan Museum 7(1&2):1-54. Langdon, K.R., K.D. Johnson. 1994. Additional notes on invasiveness of Paulownia tomentosa in natural areas. Natural Areas Journal 14 (2):139-140. Melhuish, J.H., Jr., C.E. Gentry, P.R. Beckjord. 1990. Paulownia tomentosa seedling growth at differing levels of pH, nitrogen, and phosphorus. Journal of Environmental Horticulture 8:205-207. Niemeier, J. 1984. I had to kill the empress. Arbor Bulletin Arbor Foundation Seattle University Washington 47(2):21-23. Petrides, G.S. 1972. A field guide to trees and shrubs. The Peterson Field Guide Series. 2nd ed. Boston: Houghton Mifflin Co.
Rehder, M.A. 1927. Manual of cultivated trees and shrubs. MacMillan Co., New York. (Reprinted 1983): Dioscorides Press, Portland, Oregon. Sand, S. 1992. The empress tree. American Horticulturist 71:27-29. Sanderson, K.C. 1972. Effect of photoperiod on the growth of empress tree, Paulownia tomentosa seedlings. Alabama Agriculture Experiment Station Hort. Service 18:10-11. Sticker, O., M.F. Lahloub. 1982. Phenolic glycosides of Paulownia tomentosa bark. Journal of Medicinal Plant Research 46:145-148. Swanson, R.E. 1994. A field guide to the trees and shrubs of the southern Appalachians. Baltimore: Johns Hopkins Univ. Press. Williams, C.E. 1983. The exotic empress tree, Paulownia tomentosa: an invasive pest of forests. Natural Areas Journal 13(3):221-222.